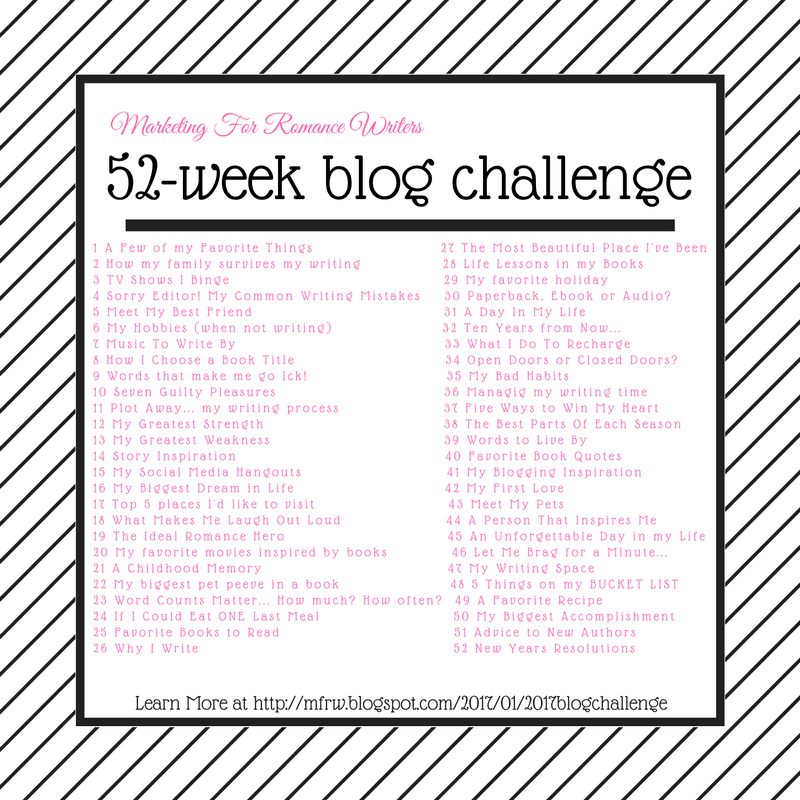 Welcome back to the MFRW 52 week blog hop challenge. It is week 22 and our topic is our biggest pet peeve in a book. This is harder than I thought it would be since I read so much. After much thought and deliberation I think most of mine spring from the blurb or pumped up reviews. #1 I hate reading a blurb, gettign all excited and the book delivers nothing the blurb promised. Don’t get me started on the cute blurbs that are just hyped up one liners, such as…A captivating story of love, hurt, romance and mystery. Ok, that’s all good but tell me a little more about what this book is about not a generalization. Tell me something about these particular characters and the plot. Make me want to pick this up and buy it. Now once I have it in my grubby little hands nothing irks me more than the story being completely something else than the blurb suggested. If it says some mystery give me some mystery not one page of a quick rundown. If it promises romance give me some not one scene at the end. I also don’t like big words or names in a story. Keep it simple so I don’t have to stop every page and look up a word or try to sound out a name that not even in the dictionary. That kills the flow for me. Since i am avid book reader I also am picky. If you borrow one bring it back and I hate seeing people that dog ear or leave a book open upside down. Please use bookmarks and put it on your bedside table or where it belongs after reading. What is your biggest pet peeve in books? Let’s go see what the other bloggers biggest pet peeves are. Man I agree with the blurb. I recently read a few where I didn’t get any idea of what the book was at all. It’s one of the characters ‘talking’ to you but I’m still left wondering what the actual book was about. Add to that the cover that also gave no clues and I was saying pass and moving on to the next option. Most of my books now are on my e-reader, but I do fuss at my boys for bending down pages. There are plenty of bookmark options so don’t go bending the page. Most of my books are too. My husband leaves is laying open on the bed or table. drives me nuts. I agree with you about the blurbs. Tell me what the book is about! And, some blurbs are LONG – I feel like I’ve read half the book already when I get to the end of them. Oh yes. I hate those wordy ones. I hear you about the blurbs. Tell me what the book is about not how good you think it is. You’re the author; you’re biased. My first book was pubbed in NY. The hero was a former race car driver and the editor who wrote the blurb found every car cliche possible. Rolling eyes. My writing partner and I changed it when we got the rights back and self-pubbed it. As a writer of science fiction, as well as romance, i particularly agree about long or difficult names. According to some survey I read years ago, fear of difficult names is one of the biggest reader roadblocks to the genre. In several books I’ve had characters from India, and I always use names like Raj or Singh, never Ramakrishananda. I am very picky about Science Fiction for that reason. Glad you stick to simply to names. I find blurb-writing incredibly hard. And high-concept tag lines? Forget about it! I get the importance of it in snagging an Amazon shopper’s attention, but that whole issue of “false advertising” makes the writing a struggle. Yep Blurb writing is hard and I actually like some of the cute taglines if they are true to the story What I am talking about is I read one lately that the blurb made it look like a romance with some suspense but the only romance was a quick roll in the hay at the end of the book and the only suspense was a case that was mentioned also towards the end.The first half of the book it looked like the two characters were friends and would be a friends to lovers but about halfway through we meet the new man. it was like two different books.